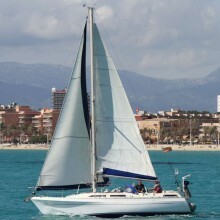 Hi, short-handed skipper looking for one easy going/sociable person comp crew or inexperienced who want to do some recreational sailing, build a few miles, practice our sailing skills, plus see and explore beautiful & sunny Mallorca for a few days. 25/26 May to June 2nd. Possible to fit a pair of people in, but prefer a single person to join the current crew of two (both day skipper qualified). Shared food, drink and mooring costs. Boat descriptionHighly spec'd - all the usual you would expect.